When we first hear the B&O Play Beolit 17 we assumed it was a wired speaker. That it can kick out such considerable volume, with smooth low-end bass and a considered balance of mid and treble is true testament to the Bang & Olufsen roots to which B&O Play is linked. Play it loud, play it proud - there's little better than the Beolit 17. When it comes to sound quality, Danish high-end maker Bang & Olufsen is well regarded. The company's offshoots, B&O Play and Beoplay, also create excellent portable speakers and headphones at more accessible price points. Not that the Beolit 17 is exactly cheap, given its £449 asking price, but then how many other portable speakers - we say that loosely, it's semi-portable really, given the weight - can kick out sound this significant without needing to be permanently wired up to the mains? If you're looking for a proper speaker that can be used around the house or carried outside into the garden for BBQs, B&O Play is onto something with the Beolit 17. Especially in this updated design, which is far neater than its 2015 predecessor. The last Beolit product we saw arrived on the market before USB Type-C was even a thing. That might seem like a strange place to start this review, but it's more important than it sounds: the Beolit 17 has a small USB-C port used for charging, whereas the older Beolit 15 had a full-on Figure of 8 mains cable tucked away in a rear pop-open drawer that made the design seem fussy. The Beolit 17 is anything but fussy. 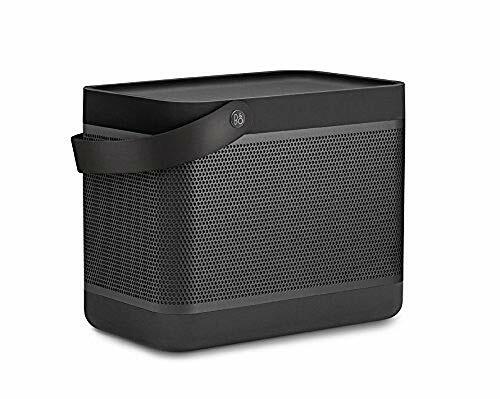 We think this giant picnic hamper-alike speaker touches on all the visual design language that B&O Play so often use, such as the aluminium grille with circular openings, or the use of leather for the carry handle - which is attached by a B&O button-like circle, for an extra design cue. The sides of the Beolit 17 aren't covered in unsightly buttons either. It's up top you'll find the five buttons: power, volume up, volume down, Bluetooth pairing, and a one-touch configurable button which works in conjunction with the Beoplay app to play/pause, adjust EQ (via ToneTouch), or continue where the last played track was during your last session. The Beoplay app isn't quite right, however, as we've found it to be glitchy. It's crashed our Android phone a number of times, refused Bluetooth pairing on others, and won't be the most intuitive source from which to play your tunes if you don't want. That said, the ability to add multiple B&O Play devices makes sense, as does the simplistic design. Going back to that USB-C port for one moment: it can be used to charge up external devices, such as your phone, should you need it. It will output up to 500mAh maximum according to the spec sheet, as to not drain the Beolit 17's full 2200mAh battery too quickly. With nothing plugged in, and the volume set conservatively enough, we've been getting full-on days of listening out of this portable - which is impressive considering the sheer clout of the audio. Being a portable device, the Beolit 17 is best setup for wireless use. We've been using paired devices via Bluetooth and have found the connection to be solid at all times. There's no official mention from B&O Play of aptX or aptX HD technologies for higher quality wireless transmission, however. Nonetheless, the sound quality is really something. Considering the Beolit 17 is a portable, the veracity of the bass is outstanding. A quoted 37Hz low-end is possible, which beyond just plump drum kicks will give you smooth sub-bass that's perfect for underground tracks - without overdoing things. That's what's very "B&O" about the balance - there's bass, but it's not devastating to the rest of the mix. Separate tweeters ensure ample high end, while a full-range driver handles everything in-between the frequency ranges. At lower volumes this mixture of outputs doesn't make a sound thats 100 per cent cohesive, however, with slightly louder levels brining everything together in perfect unison. Part of this perceptive cohesion of sound will be down to the speaker placement for apparent 360-degree sound. Yes, the Beolit 17 sounds good from the majority of angles around it - but the sound isn't uniform throughout its rotation. It sounds best from the front, or to a slight angle, rather than listening to it from the rear. Still, it's a good proposition for truly room-filling sound - or sound in open spaces for all your friends to enjoy. If you are in an open space then the sheer volume that can be achieved without distortion is considerable from a portable device. That'll be down to the amps, then, which also go some way to explain the Beolit 17's 2.6kg weight. Nonetheless, heavyweight is a term that can be used to describe the Beolit 17's overall soundscape and much as it can be when trying to cart the product around. When we first hear the B&O Play Beolit 17 we assumed it was a wired speaker. That it can kick out such considerable volume, with smooth low-end bass and a considered balance of mid and treble is true testament to the Bang & Olufsen roots to which B&O Play is linked. Sure, it's expensive, the sound isn't perfectly cohesive from all angles or when the volume is particularly low, but these are minor nitpicks from a product that's good enough to cater for all your audio needs - both at home or outside. Play it loud, play it proud - there's little better than the Beolit 17.